Follow a family on its way through the complexities of a modern day airport. 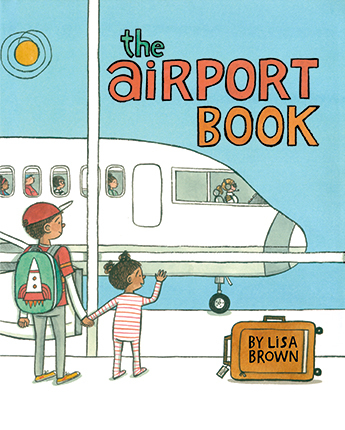 Booklist - 03/15/2016 A boy, his little sister, and their parents pack for a trip, taxi to the airport, and stand in line. Maybe missing Monkey (the stuffed animal packed in her checked luggage) or maybe alarmed by the security scanner, the young girl cries, but she is soon distracted by her surroundings in the bustling airport. After waiting at the gate, they board the plane and fly to another airport, where the father’s parents welcome them. It’s a happy reunion for this biracial family, and soon they head to the beach. The clearly written text is straightforward, telling what happens in the airports and on the plane, while occasional comments from the main characters and their fellow travelers add personality to the narrative. The intricate ink-and-watercolor illustrations offer a treasure trove of discoveries for detail-minded kids, who will pore over the scenes, notice recurring characters, absorb speech-balloon conversations, and follow silent subplots unfolding in successive scenes, such as Monkey’s adventure in the plane’s luggage compartment. Informative and entertaining enough to be handed out by any airline hoping to ease preflight fears. - Copyright 2016 Booklist. Bulletin for the Center... - 06/01/2016 Air travel may be routine for many adults, but it’s new and fascinating to kids, and this book documents the process from packing to arrival at the destination. 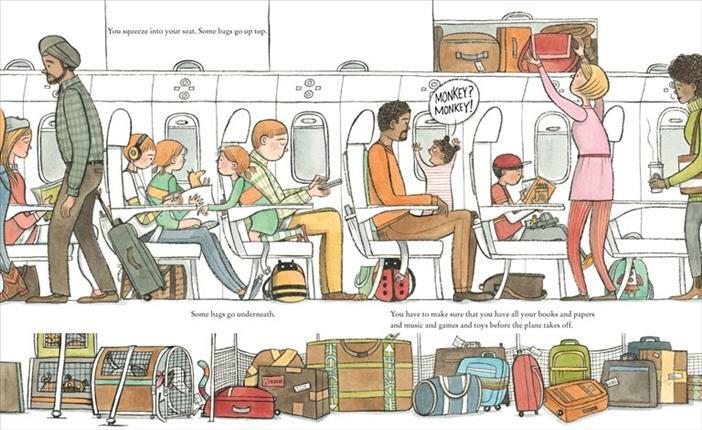 Simple explanatory text provides basic information with occasional touches of wry humor (“Inside the airport you stand in lines”) while the illustrations document the progress of a family of four amid the teeming bustle of their fellow travelers. The book’s direct address (“You buckle your seatbelt tight across your lap”) gives it a you-are-there flavor that focuses on the experience rather than the whys and hows; the prose manages a pleasing storytelling rhythm even as it conveys information (“Outside there are clouds and clouds and clouds”). The line and watercolor art, however, is the real draw here; airport scenes feature a realistically diverse array of humans (the family is interracial; people of all colors, dress, and ability appear in the airport) and burst with stories large and small. Most significantly, the young girl misses her stuffed monkey, who’s been mistakenly packed into the family’s checked bag (the monkey’s trailing tail identifies the bag on its progress through the system), but there’s also a woman who won’t get off her phone except for something special, a dog traveling in the hold, a mysterious huge package, and a few other stories. Adults will also notice a few sly jokes, such as the guy at arrivals with a sign indicating he’s waiting for “Earhart” (presumably for the woman in the aviator helmet and goggles), or the mother’s use of the traditional pub-closing phrase “Hurry up, please, it’s time” to get her family on the road. Whether kids are readying for their first plane trip, wondering where parents go after they’re dropped off at the terminal, or just looking for some imagined travel, this will set them on the runway. DS - Copyright 2016 The Board of Trustees of the University of Illinois.